360orthoCare is prescriptive video platform that provides diagnosis-specific, patient-specific physical therapy programs that can be conducted at home or work. The problem we solve: There is a need for portable medical records that correlate to patient-specific treatments that track progress and encourage compliance. 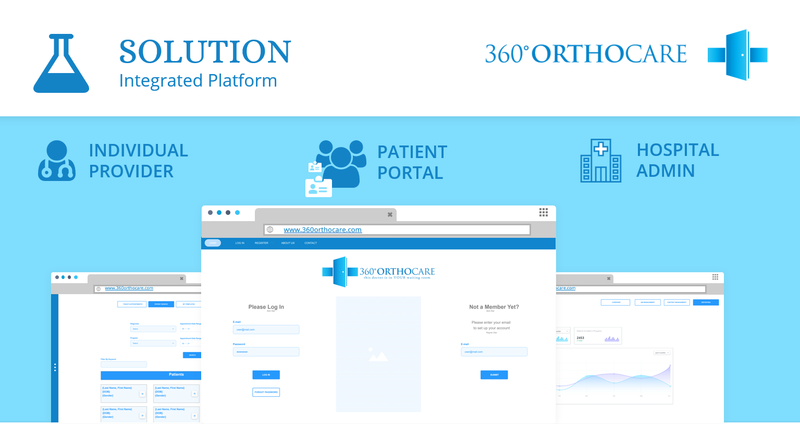 About our solution: The 360orthoCare platform solution provides a way to more fully engage patients in their treatment while improving convenience and compliance. Additionally, the streamlined solution offers true cost leadership through increased practice efficiencies. The 360orthoCare platform employs mechanisms for data collection to assess long-term outcomes of specific treatments, implants, surgical and physical therapy techniques. We have recently completed the initial development of the patient, admin, and clinician portals. We are about the produce the physical therapy videos to populate the database. We expect to begin beta testing in Q2 of 2019. Bio: Dr. Palo is a physicist and Board Certified Orthopaedic Surgeon. Dr. Palo operates a large healthcare practice in the New Orleans greater metropolitan area. Through his practice, Dr. Palo realized that there was a clear pathway for improvement in healthcare delivery. He decided he wanted to utilize his unique combination of background, education, and worldview to completely change the way orthopedic care is delivered. Biography: PJ Landers, owner of Landers Physical Therapy, received a Bachelor’s degree from the University of Southwestern Louisiana in 1997. He continued his education at the University of St. Augustine for Health Sciences and graduated in 2000 with a Masters of Physical Therapy degree. While working as a full-time physical therapist, he further progressed his education and received a postgraduate Doctorate of Physical Therapy degree from the University of St. Augustine for Health Sciences in 2003. PJ has extensive postgraduate education and became nationally recognized as a Certified Manual Therapist in 2003. He is one of the few distinguished physical therapists in Louisiana who has received this certification. In 2007, He became nationally recognized as a board certified Orthopaedic Clinical Specialist by the American Board of Physical Therapy Specialists, making him the only physical therapist in the Covington/Mandeville area who holds this distinguished certification. PJ is dedicated to his profession and strives to achieve the highest standards of patient care to achieve the best possible outcomes. 360orthoCare offers accessible physical therapy treatment prescribed by clinicians and physical therapists and integrated into their electronic medical record, which allows for long-term tracking of physical conditions and compliance by medical experts. 360orthoCare optimizes workflow by standardizing the delivery of information and allows for cross-specialty communication, tracking, monitoring of compliance, correlation of conditions, and analysis of treatments within a patient's health record. 360orthoCare optimizes workflow by allowing clinicians to optimize their time with the patient and allows for cross-specialty communication, tracking, monitoring of compliance, correlation of conditions, and analysis of treatments within a patient's electronic health record. 360orthoCare can benefit Partner by allowing its clinicians and physical therapists to optimize their time with the patient while allowing cross-specialty communication, tracking, monitoring of compliance, correlation of conditions, and analysis of treatments within a patient's health record. The analytics associated with the 360 platform will help guide patient outcomes. The 360orthoCare solution directly helps patients reduce their out-of-pocket healthcare costs by giving patient-specific affordable, more convenient access to physical therapy treatments. The cost of the 360 platform is less expensive than traditional care up front and the convenience of the platform provides better patient outcomes, therefore, reduced long-term healthcare costs. 360orthoCare is based in St. Tammany Parrish, Covington LA. The filming of videos is being conducted by local production companies and we are currently looking to expand our team within the New Orleans Metropolitan Area. All software and software rights are owned by 360orthoCare. Funds will be used to (a) complete and beta test the HIPAA compliant web platform, (b) develop sales and marketing teams, and (c) expand the content of the video database. Imagine a portal where all your medical information is in one place. You own it. You take it with you. You share it with any doctor at any clinic. Through this portal, your doctor can send you educational videos about your illnesses, prescribe remote treatments, and remotely monitor compliance. Our beachhead market consists of physical therapy and orthopedics. Our solution provides HIPAA compliant, real-time, clinician or physical therapist prescribed video programs tailored to the patient. The cost of each program is less than the accumulative costs of physical therapy co-pays and you can do it out of the convenience of your own home or office. I believe essay writer: the reformers know what they are doing and will follow their ideas about medicine with full regard for public laws and trust.